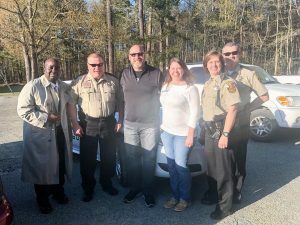 On April 19, youth motivational speaker and Amazon bestselling author Jeff Yalden visited Mathews, Virginia – a community in the Chesapeake Bay region of the state. Yalden was invited by the Mathews County Sheriff’s Office to speak to high school and middle school students about life choices, mental health, behavior, and attitude. He also presented to more than 100 parents and community members that night. Investigator April Edwards from the Sheriff’s Office organized Yalden’s visit. It’s fitting that after some due diligence about Yalden himself, she knew that he would be the ideal candidate to instill a sense of purpose, hope and direction to kids who might otherwise be tempted to go down the rabbit hole of risky behaviors and compromise their self-respect. She added that the kids developed trust in Yalden within two hours and then poured their hearts out to him. Yalden was grateful to Edwards for going to bat for him. “Thank you for organizing and fighting to make it happen. We made a difference today,” he said. In his more than 25 years working with young people and school communities, he said he has met many awesome teachers, administrators, coaches and counselors, but he cited then-interim and now permanent Mathews High School principal Alexis Foster as one of a kind. 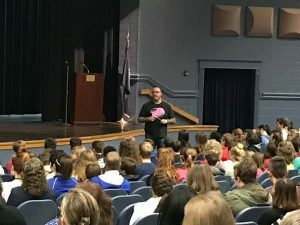 “Today’s teens are growing up differently and need trusted adult who can find the perfect balance of understanding, discipline and encouragement, while providing inspiration and hope – an individual who shows beyond any doubt that they truly care about the students that walk through their doors,” Yalden said. Foster himself was more than pleased with the result of Edwards’ work to bring Yalden in for the day. What Yalden most wanted to instill in the young people in attendance was the fact that the world owes them nothing. “You get out of it what you put into it,” he said. Learn all about The Jeff Yalden Foundation HERE. To book Jeff now, call (800) 948-9289.